The new General Manager of Univision Detroit, Ms. Jessica Pellegrino visited recently Sangria Tapas Cafe in Royal Oak. Ms. Pellegrino is a veteran broadcaster, originally from Texas, who moved to Detroit in 1992. Ms. Pellegrino was previously the Univision's director of government and community affairs. We wish her all the best in her new position. Another great Salsa night @ Mad Frog, with people enjoying the awesome new dance floor and Non-Smoking room! This was the last performance of Tropicoso in 2006 at Mad Frog. They are back on Monday, January 1st, 2007. Celebrate New Year's Eve with DJ Rudy Alvarez! Now EVERY FRIDAY at 10 PM @ Club Rain!!!!! 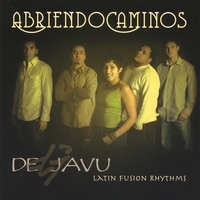 The ULTIMATE LATIN MUSIC PARTY!!!! And the perfect place for people from Cincinnati, Columbus, and Indianapolis to meet half way! On Dec. 8, we celebrated Carla's Birthday, our "100% Panamena". The music was provided by DJ Daniel. 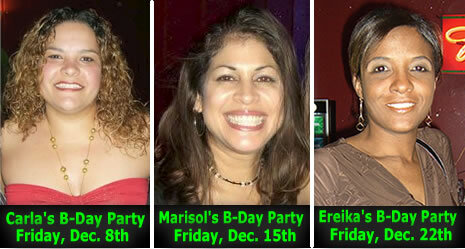 On Dec. 15th , we'll celebrate the Birthday of Marisol with our own DJ Danny D! And on Dec. 22th , we'll celebrate the Birthday of Ereika with DJ TaZ from Indianapolis! Read more... | 4101 bytes more | Comments? The Greater Cincinnati Chapter of NSHMBA started the 2006 Holiday Season with a Winter Celebration at the prestigious Bankers Club, bringing its "familia" together and honoring its Sponsors and others who have been instrumental in making this past year a success. The biggest event for the Cincinnati chapter in 2006 (and the biggest ever, for that matter, for this chapter) was the 17th Annual NSHMBA Conference taking place in Cincinnati. Providing the perfect mix to appeal to both attendees and exhibitors, Cincinnati USA has attracted record-breaking attendance for NSHMBA. More than 7,000 Hispanic MBAs and students, 250 companies, and 90 academic institutions gathered in Cincinnati USA at the newly expanded and renovated Duke Energy Center. NSHMBA Cincinnati honored local sponsors that made it possible, such as the lead sponsor of the Conference - Procter & Gamble, and such companies and organizations as: Cintas Corporation, Fifth Third Bank, The Kroger Company, GE Aviation, Chiquita Brands International, Western Southern Financial Group, Duke Energy, Scripps, DCI, 3CDC, Regional Chamber Cincinnati USA, Hispanic Chamber Cincinnati USA, Cincinnati Zoo & Botanical Gardens, Cincinnati Ballet, Cincinnati Opera, Cincinnati Playhouse, Give Back Cincinnati, Fine Arts Fund, NURFC, Cincinnati Symphony, Metro, Deloitte, Ethicon Endo-Surgery, Luxottica Retail, National City Bank, Kaplan, Northern Kentucky Univ., Xavier Univ., Univ. of Cincinnati, and Miami Univ. Glenna Anderson, one of the founding members of the chapter, was honored with a Special Lifetime Achievement & Leadership Award. The Dan Beard Council, Boy Scouts of America will host its first Soccer and Scouting tournament on Friday, December 22, 2006 from 11:00 a.m. to 3:00 p.m. at The Field Sports Arena in Monroe, OH. We are expecting over 75 kids to participate in the tournament. The event will feature soccer games, Scouting activities and awards for participation and achievement. The professional indoor soccer team, Cincinnati Excite, will referee the games and perform a half time show. This tournament will offer Scouts a chance to show off their soccer skills to their families and the values they have learned from Scouting. The Soccer and Scouting program is aimed at reaching out to the Hispanic youth and families. This free program combines the life-long values of Cub Scouting with the competition and fun sport of soccer. Read more... | 765 bytes more | Comments? DAYTON FUNNY BONE just added a last minute show with Carlos Mencia, from Comedy Central's Mind of Mencia show.